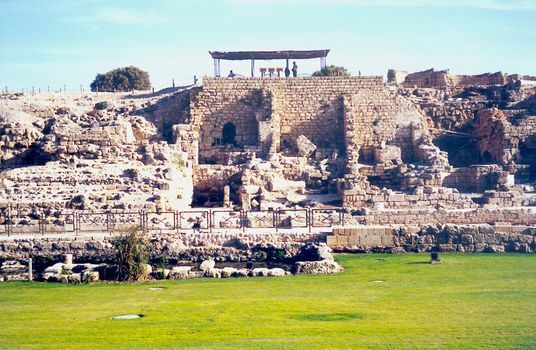 Herod built Caesarea in little more than a decade after Augustus Caesar in 30 B.C. gave him the place. 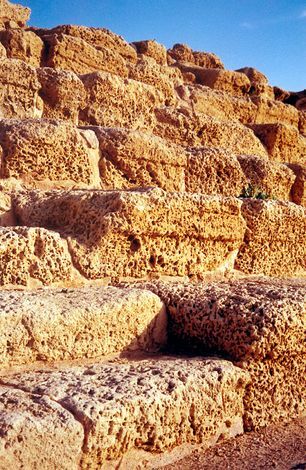 In return, Herod thoughtfully named the city after Augustus, and it grew to be a major port. 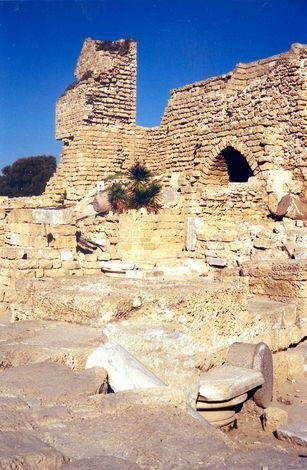 An earthquake in the second century destroyed the artificial harbor, but a makeshift one was put together to the south, and the town grew through the Byzantine period before entering a long decline after the Arab conquest. The Crusaders seized the place in 1101 and fortified a part of the Roman city as well as renewing the old harbor. After they left in 1265, the town lay abandoned until 1884, when the Turkish government settled a small group of Bosnians here. They survived until their village was destroyed in 1948. Today the site is an Israeli national park. 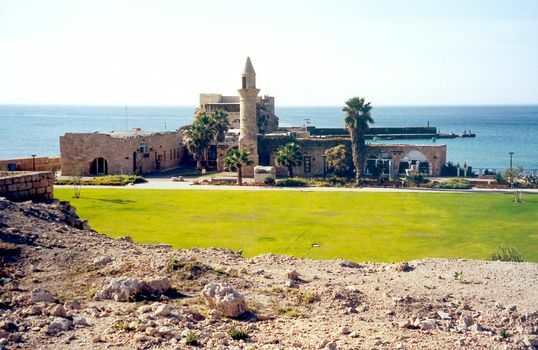 The lawn occupies Herod's inner harbor, where ships docked at the foot of a platform supporting a Temple of Augustus, from whose site this picture was taken. The mosque marks the site of the Bosnian village destroyed in 1948 and is on the site of the Crusader citadel. The breakwater in the distance enclosed Herod's outer harbor, destroyed in 130 but rebuilt by the Crusaders. Standing in what was the inner harbour. Herodian (which is to say really big) blocks on the right mark the ancient dockside. A wide Roman staircase climbing to the temple platform is on the left. A cathedral and mosque later occupied the platform. Close-up of the dockside and temple mount. 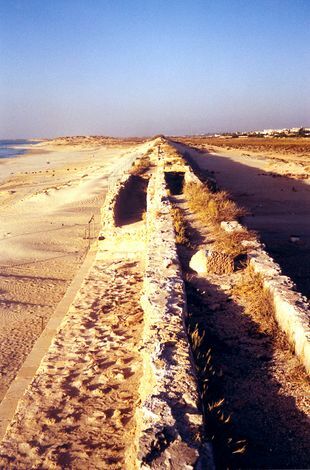 The most substantial city walls are of the small Crusader city. Here, bits of Roman columns can be seen re-used as fill by the Crusaders. 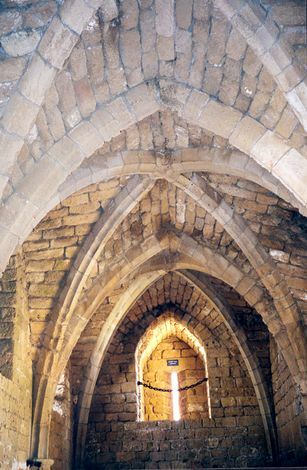 Inside the east gate of the Crusader city. It was designed with a right-angle turn, so one enters from behind the camera, then turns right to enter the city. 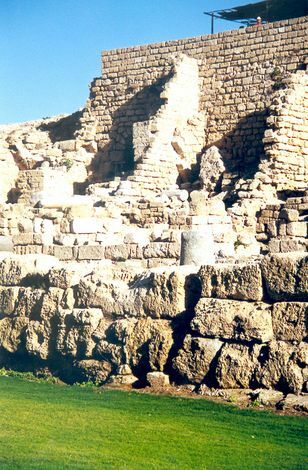 Here are a few of the seats and a staircase (at the lower left) from a semicircular theater Herod built just south of the city wall; it seated about 20,000. 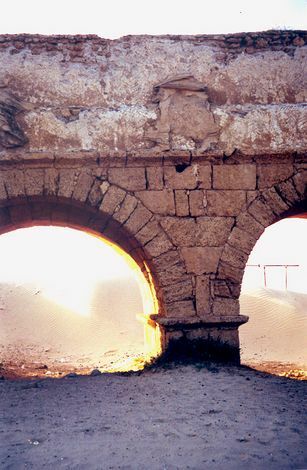 Herod built an aqueduct to convey water to Caesarea from the Crocodile River: his is the right-half of the structure. Hadrian doubled the aqueduct's capacity by assigning legions to build the left-half. The Mediterranean is on the left; the view, north. 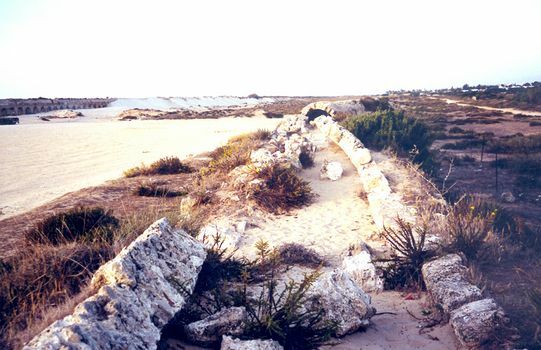 Hadrian's side of the aqueduct, taken from the beach side. The old aqueduct is on the far left. In the center is a newer, larger-capacity, and once-covered aqueduct built in the fourth century, when the city had grown enough to need more water than the aqueduct of Herod and Hadrian could provide.